Those of us at the Literacy Council who knew her are saddened by the passing of Elizabeth Derr on July 14, 2018. 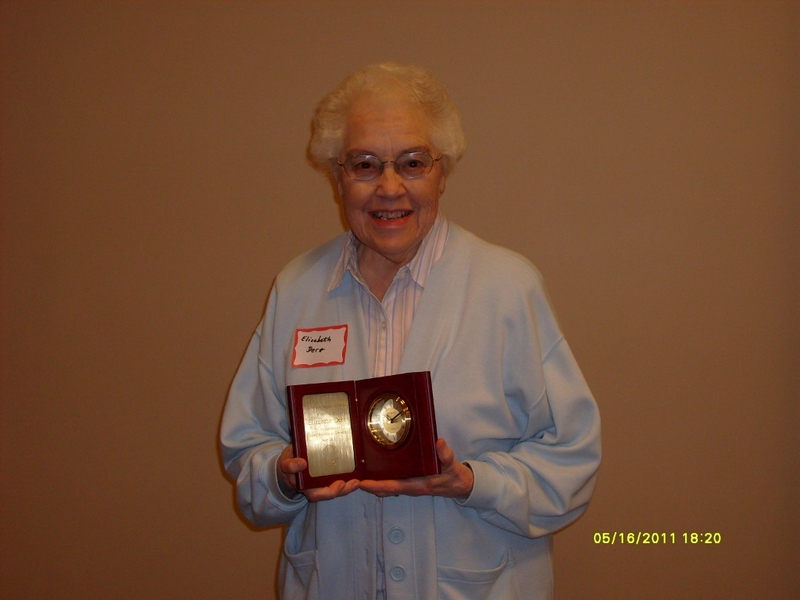 Elizabeth volunteered for the Literacy Council continuously since she began as an office staffer in 1988 until reluctantly retiring, at the age of 88, in 2016. She became a tutor in 1989 and worked with several students. Soon after, she became the Supplies Chairman, responsible for keeping track of and ordering all or our supplies and teaching materials, a collection of over 5,000 items used by our 120+ tutors and 250+ students, a job she did until retiring. Elizabeth’s service was special not only because of the length of time, 28 years, but because of the quality of her work. You could count on her to be there every week for her shift and to know how to handle whatever was needed. She was the go-to person for anything you needed to know about the office, and she was the one who could find what you were looking for, from a book to a paper in the file cabinet. She kept track of our books and supplies and reminded us of upcoming needs. She tracked down sources of tutoring materials, finding the best deals on them, and kept them all organized. She made it much easier for all the rest of us to do our work. Over the years, in her quiet, efficient, and dedicated manner, she contacted many people in the community, trained many new office staffers, and signed up countless new students and tutors. She went above and beyond the requirements of her volunteer position, and at times was the only regular office staff keeping our office open. In 2011, she was the recipient of our highest honor, the Elizabeth H. Seligmann Award, which is given only occasionally, for sustained and significant contributions furthering the goals and objectives of the Literacy Council, consisting of outreach to others and reflecting distinctive qualities. She was wonderful to work with and is greatly missed.